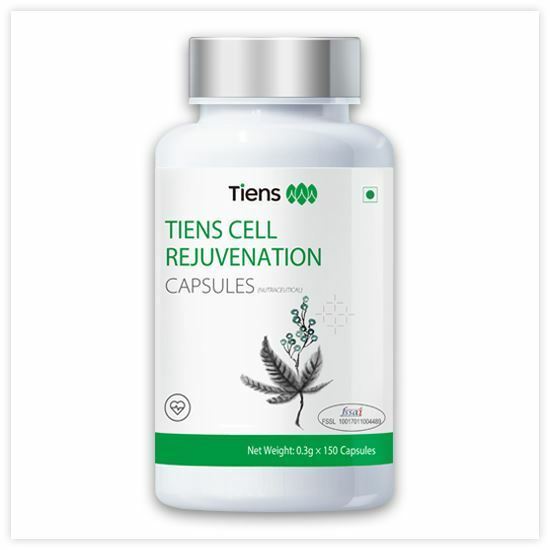 Tiens Cell Rejuvenation Capsules are formulated based on the Traditional Chinese Medicine (TCM) which primarily supports the function of energy system, cardiovascular system & blood circulatory system of our body. This diet/food supplement is specifically formulated to balance the yin (negative) and yang (positive) energy of our body functionality. It also aids in improving natural defense system of the body. It has a combination of 4 antioxidants that keeps heart and circulatory system healthy namely: 1.Carrot powder 2.Gynostemma pentaphylum 3.Theopolyphenol and 4.Vitamin C.
Assists in reducing the contents of harmful lipid in blood & strengthens cardio – vascular system. Helps in reducing blood sugar level. Provides herbal support to the body. Strengthens the immune system of human body. Acts as strong antioxidant and eliminates free radicals. Delays age-related degeneration and helps in prevention of wrinkles. Improves oxygen uptake in low oxygen environment. Helps in good vision and acts as blood purifier. Reduces low-density lipoprotein (LDL) of body. Protects from stress and fatigue. People with high fat or high protein meals. People with stress and fatigue.